The Biggest Celebrity Sweets Con on Earth! 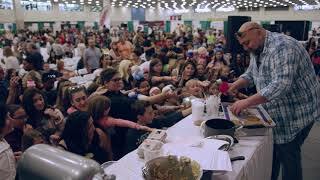 Our next event is "The Sweets Show" Sept 22nd & 23rd, 2018 at Anaheim Convention Center, with guests Duff Goldman, Adriano Zumbo - “Zumbo’s Just Desserts” “Sugar Rush”. LA Cookie Con and Sweets Show is the West Coast's biggest convention celebrating all things sweet at Anaheim Convention Center. We attract tens of thousands of attendees in your target demographic. And have organic, natural and healthy food alternatives. 2018’s LA Cookie Con was SOLD OUT! February 2017’s Celebrity guests included Duff Goldman “Cakemasters” Rosanna Pansino “Nerdy Nummies” and Elise Strachan “My Cupcake Addiction”. Ken Jeong "Dr. Ken", Olivia Sanabia star of the Amazon series "Just Add Magic" and Burt Ward "Robin" Batman TV Series. We also have coverage from all the major networks which include “Jimmy Kimmel Live”, KABC, KCal News. 100% of all money made for our cake competition will be donated to Smile Train for kids and Shriners Hospitals for Children. Our next event is "The Sweets Show" Sept 22nd & 23rd, 2018 at Anaheim Convention Center, with guests Duff Goldman, Adriano Zumbo - “Zumbo’s Just Desserts” “Sugar Rush” Rachel Fong "Kawaii Sweet World" and more to come. The Biggest Celebrity Sweets Cons on the West Coast! The Comic- Con of the Genre!